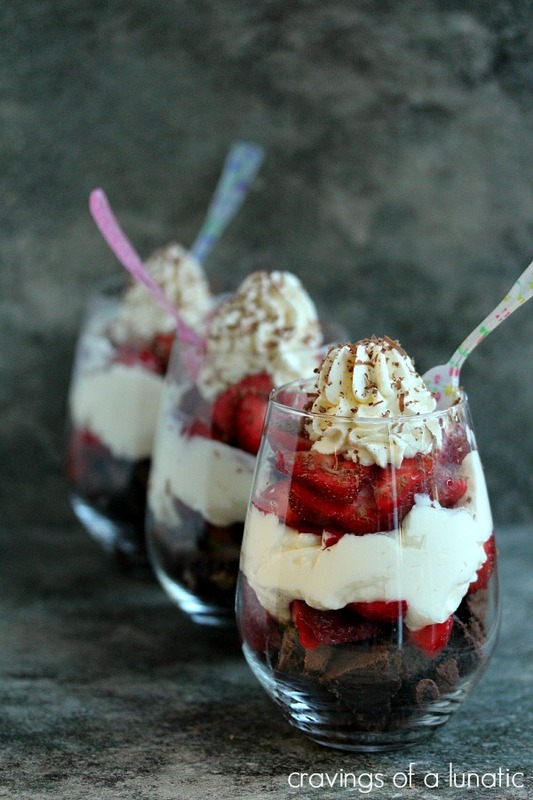 Simple recipe to make Strawberry Brownie Parfaits topped with strawberry flavoured cream cheese whipped cream. You’re going to love this dessert! 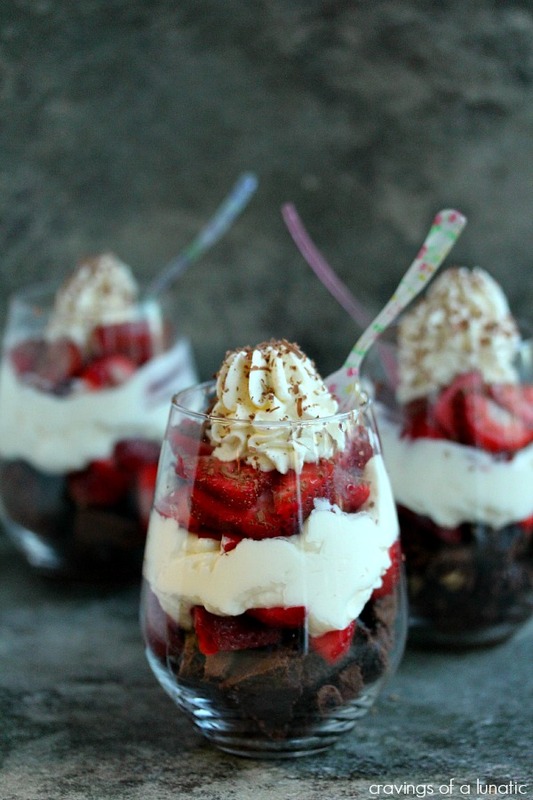 Click here to pin these Strawberry Brownie Parfaits! This recipe is filled with chocolate brownies, strawberry simple syrup, strawberries, and whipped cream. It’s absolutely delicious and is always a huge hit when we entertain dinner guests. 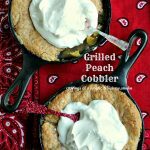 When I originally made this recipe a fellow blogger had started a company that made simple syrups. Since that time she has closed her business. I’m editing this post to include homemade simple syrup and other options. 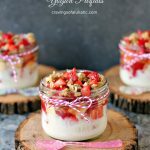 I want everyone to be able to make these delicious parfaits so I’ll give you a couple of options you can use to make these. That way no matter what you have on hand, you can still make these. Huge apologies to everyone who tried to make these with a missing ingredient. I had no idea Heidi has discontinued Not So Simple Syrups or I would have edited this sooner. 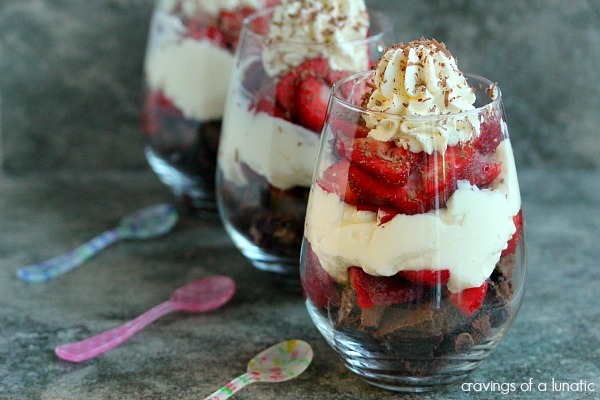 Since these Strawberry Brownie Parfaits are one of the most popular recipes on the blog I wanted to take a minute to thank everyone who has pinned, tweeted, shared, or made these. 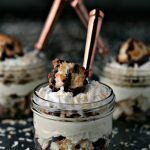 So, if you love brownies and parfaits this recipe is for YOU! It is so easy to make and everyone will gobble them up in record time. They are always a huge hit when we serve them. I love using simple syrups to macerate berries. Simple syrups are divine drizzled over fruit salads. So I knew I wanted to incorporate that idea into the recipe. However that was too easy of a leap so I wanted to take it a step beyond that. I use simple syrups in dips and fillings as well for some added flavour boost. So I thought I’d add a little to the cheesecake type filling for the parfaits. That way it would just add another level of strawberry flavour to the dish. It worked beautifully. The syrup is not overwhelming at all, it’s subtle and just sheer perfection in fillings. You get that hint of flavour without getting smacked in the face with it. That’s the kind of dessert I love. Not one element over powers the others. You can use store-bought brownies and whipped cream if you like. I’m not above cheating when time is of the essence. I made my own brownies for this because I was testing out some brownie ideas any way. So I had some left over. Parfaits are a great way to use up leftover brownies, cakes and even cookies. You can buy cool whip if you like for this. I whipped up my own. Honestly, if you have heavy cream on hand it’s super easy to make your own whipped cream. If you don’t have time I think cheating is okay. Never feel guilty if you need to do that. Life’s too short to stress over the small stuff. However if you’re stressing about anything at all these parfaits are a sure-fire way to cheer yourself up. 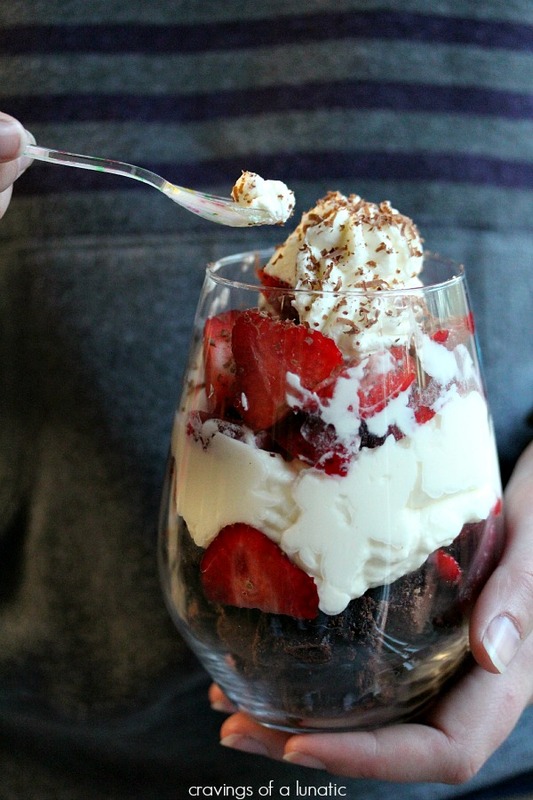 Simple recipe to make Strawberry Brownie Parfaits topped with strawberry flavoured cream cheese whipped cream. You're going to love this dessert! Place the strawberries, water, and sugar in a medium size saucepan. Cook over medium heat, stirring occasionally while the sugar dissolves. Once the mixture reaches a boil reduce the heat to simmer. Cover and simmer for 15 to 20 minutes. Check every 5 minutes or so to make sure it's reducing and not sticking to the pan. Remove from heat and strain the mixture through a fine mesh sieve. Discard everything in the sieve. Transfer the simple syrup to a container and allow to cool for about 20 to 30 minutes. Cover and store in the fridge for up to 3 days. Pop the strawberries into a glass bowl or container. Add the sugar. Pour the cooled simple syrup over top. Mix it all up and cover. Pop in the fridge for at least 30 minutes, my recommendation is 2 hours. Softens them just enough while still leaving some texture. In your stand mixer bowl, add the heavy cream, sugar and Strawberry Simple Syrup. Start on slow for less splashing, let it start to thicken, then turn it on high and mix until it's fluffy. Add in the softened cream cheese and mix until combined. Chop up your brownies into bite sized pieces. Divide into 4 and pop them inside glasses. I used stemless wine glasses for mine. Take the 2 tablespoons of Strawberry Simple Syrup and drizzle it over top of the brownie pieces. Now put a layer of the macerated strawberries over top of the brownies. Add a huge layer of Strawberry Cream Cheese Whipped Cream layer into each one, reserve enough to pipe a little on top of each parfait at the end. Add another layer of macerated strawberries over the whipped cream. Use a piping bag to top each parfait with a little more whipped cream. Take a zester or fine grater and run a piece of chocolate along it to garnish the top of each parfait with chocolate. You could top with a strawberry for added pizazz. I used all mine inside the parfaits so I didn't have any left for pizazz. Pop in the fridge for at least 30 minutes, or up to a couple of hours. Serve with a big old parfait loving smile! I used my Best Brownies in the World for this. You could use your own recipe, or even use store bought. No judging here. You can also macerate the berries with orange juice and sugar. Or you can macerate berries quite well with just sugar. If you leave them in sugar they soften naturally. You could not bother macerating the berries at all and just toss them in fresh. This recipe can be made in so many ways. If you can use any kind of berries, any kind of brownie or cake, or any kind of whipped cream. Parfaits are awesome because they are so easy to adapt to your own taste. Seriously scrumptious little parfaits. The addition of the Strawberry Simple Syrup was amazing! Mix up a batch today. Get creative and put your own spin on these parfaits. Thanks for reading today! 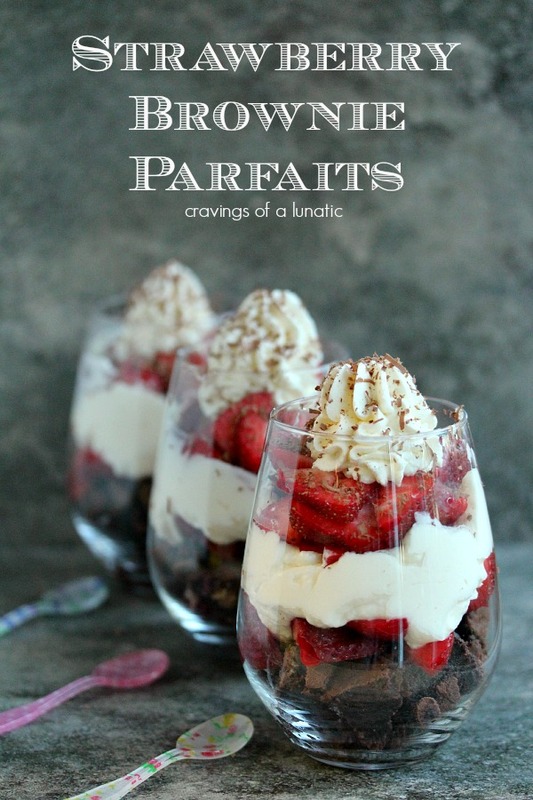 Be sure to check out my recipe index for more great parfait recipes. Also, take a minute to follow me on Pinterest. 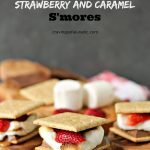 I’m always pinning fun recipes, plus lots of DIY projects and random things. While you’re clicking around be sure to follow me on Instagram. All my new recipes go up on there when they come out. I would love to try it in some fruity drinks! That sounds like sheer perfection to me Nikki. Looks delicious, Kim! I’ll have to give these syrups a try. Thanks! I think I would make a Chocolate Mint Ice Cream. Yummy! Oh my , that sounds lovely. Seriously Aly they are so good. I like the idea of freezing them so you can have them at the ready when needed. Cool concept for sure. I would make my own flavored sodas. I totally dig that idea. Beautiful parfaits. It was a serious stroke of genius to put the syrup in the cheesecake filling. I popped over to the site to see what other flavors she had and was impressed. I love the idea of making Italian sodas with them. Thanks Kristen. They would be brilliant in italian sodas. I freaking love italian sodas. Trifle, I am thinking trifle with strawberry simple syrup in the pound cake and then on the strawberries and then in the whipped cream. I am also drooling on my keyboard. Good call. The trifle, not the drool. Ha. Thanks LS. They would be perfect for lemonade. I would make some cocktails. Ok, seriously, you must have made this dessert for me?! Strawberries are my favorite food ever and chocolate comes in close second. Together, they make the perfect dessert! I’d like to try the delicious-looking recipe that you posted here! I tried to get in last night but there was a big “database error” thing. Hope that’s all sorted. What a nifty idea of making and selling simple syrup. I’d buy it and keep it on hand. 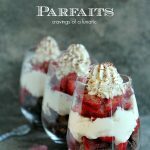 Love your beautiful parfaits! Omg my site is giving me bunches of grief Maureen. Moving hosting companies next week before I lose my mind. Sorry about the difficulties. Hopefully moving makes everything work better. Great idea to always have some on hand. It’s great for when people pop by. And thanks. I had so much fun making them. Hubs is addicted to these things now. I’d make these parfaits, for sure, as well as some beverages! Oh, my gosh, these are GORGEOUS parfaits, Kim!!! I have some NSSS in my fridge just waiting for this recipe! I got super inspired by the frozen flavored ice cubes…. Me too. They sound perfect right. Martinis…!! My personal favorite is a Lemon Drop Martini. Oh wow, that sounds lovely. I love lemon. Wow. 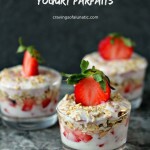 I don’t know if I could think of anything other than these parfaits? I’m definitely making them. I’d also use them in my soda stream for some tasty carbonated drinks. Awe thanks lady. Hubs went nuts for these things. He was stealing everyone else’s. Scoundrel. I need a soda stream. Badly. You know me – I use my simple syrup mainly in cocktails! Although I do sometimes use variations – like grenadine – on desserts. So I really like what you’re doing here! Really fun parfaits – thanks. You would be the perfect person to win these. I bet you could think up some amazing recipes. I adore grenadine. I keep it in my fridge at all times. For grenadine emergencies. You’d be surprised how often they come up around here. I think it’s my go to for stress. Thanks John. I can’t wait to visit you this week. I’m plugging along trying to fix broken links and my recipe index so I can return to normal soon. These need to make it to mah belly!! So pretty! I always make simple syrups and we use them for various cocktails. BUT I like your way of using them way, waaaaaaaay better! Would make ice cubes with them and put into my sweet tea. Sheer perfection, I love that idea. I bet these syrups would be fantastic for making homemade sodas. We have a SodaStream, and while I looooove it for making fizzy water, I dislike their ready-made syrups because they contain artificial sweeteners (ewwwww). I use a lot of homemade syrups, but it would be nice to have a good-quality ready-made option. Seriously right. A pear, girl you are dedicated. I should be then I’m all like “sugar”. Sad but true. They would. I seriously want a soda stream. I’m the same way with a lot of drinks. My dad was very anti artificial sweeteners so I still tend to avoid them in my old age. I might use the strawberry to drizzle over my oatmeal, the mint in my sparkling water, and everything over fresh berries and fruit! I would like to make some fun trifles. I love that idea. Trifles rule. Awe, it would be perfect for you. Mmmmm…. I would love some strawberry syrup! Oh how exciting! Both the parfaits and the syrup. I can imagine strawberries, a cheesecake-like filling and brownies to satisfy my sweet tooth. I think I would use the mint syrup to make a virgin mojito that the kids and I can enjoy! Oh- and my other half too! Thank you for telling us about this. I love the idea of a mojito. You’re most welcome. I love these products. Makes my life simpler. KimBee, you are The Parfait Boss. This looks cah-razy yummy. Gotta make them for breakfast this w/end. Miss you, too, Doll. Hope your techie stuff gets back into order soon. Strawberry and mint would both be great flavours to add to hot chocolate, I think. I think they’d be perfect for that. I would like to try some cocktails for sure!! Good call Tara. Perfect for cocktails. I would make THESE! I love strawberry and chocolate together! Ha, thanks Ramona. These were really good. Hubs is in love with them. He ate most of them. I’d like to try it in overnight oats. Would use for cocktails and would try the parfait! These would help make some amazing cocktails!!! I like experimenting with home-made ice creams, thinking this would be an easy way to add a pop of flavour. I think it would be fun to make some coffee creamer with the mint one – maybe so dark chocolate peppermint! Or both would make some delicious cocktails! I’d make these delicious parfaits! I just want this for breakfast? GORGEOUS! I need these, now!! These look yummy! Can you tell me where you bought those adorable spoons?!? Thanks Jennifer. I bought them at a place called Gracious Home. It’s a website, but I’m not sure if they are selling the spoons any more. Wow, this a winning parfait with strawberry season coming upon us any minute! And who doesn’t love brownies. I can’t wait to serve this. Parfaits always look so elegant and delectable at the same time. Hi Karen. Your comment was lost in the void. No idea why. I just saw it now. Sorry about that. I’ve updated the post with a homemade syrup. The woman who had the simple syrup business closed up shop. Which created a problem for this recipe, for sure. So I’ve adjusted the recipe and added one for simple syrup plus some tips for adjustments. So sorry for any inconvenience. I had no idea she had gone out of business until recently. Hi. Thanks for stopping by the blog. Sorry for not replying earlier. We had a surprise guest this weekend so my schedule is a bit off. You can make them in advance. Basically the longer in advance you make them the softer the brownie portion will become. I would say a day ahead is safe but any longer would make the brownies soggy and the cream would discolour from the strawberries. I think 12 hours would be better but if you work tomorrow making these tonight is a solid option. Hope everyone loves them. Are you hosting an eclipse party?